Whether you are outgrowing your current warehouse or need additional storage for seasonal surges or high-volume periods throughout the year, using a steel storage container is a great option to solve your company’s storage space needs. A steel storage container offers businesses a simple and affordable way to expand their storage space. These containers are placed on your property and provide reliable storage and easy access to meet your business requirements. Steel storage containers are available in a range of sizes to accommodate your storage requirements, making them a quick and easy storage solution. If you are not in the market for buying new business storage space but need to accommodate your growing company’s warehouse needs, steel storage containers offer flexibility for every situation. Steel storage containers can be purchased, for companies who are expanding and need additional storage, but they can also be rented for companies that are having a seasonal surge in business or those who only need extra storage during their high-volumes times of the year. Dear John offers a wide range of options to help meet your portable storage needs. Our storage containers are available in 20’ and 40’ lengths and are made from durable, high-grade steel offering a dependable, weather-proof storage option to keep your products safe and secure. 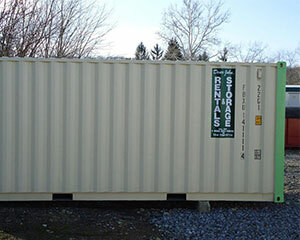 We offer storage containers for rent or purchase and will deliver them to your location. We strive to provide our customers with affordable and dependable storage solutions and will work with you to help you find the best solution to meet your business’s storage needs. With our extensive experience and high-quality selection of steel storage containers, we can provide you with the most practical solutions for your business. Contact Dear John today to learn more about the steel storage containers we have available for sale or for rent and how we can help you find the right storage solution!